My car is a Nissan 350Z from the year 2003. It has the 280hp engine and today it delivers 297hp and it is a complete rebuild in the „fast & furious Tokyo drift“ style. 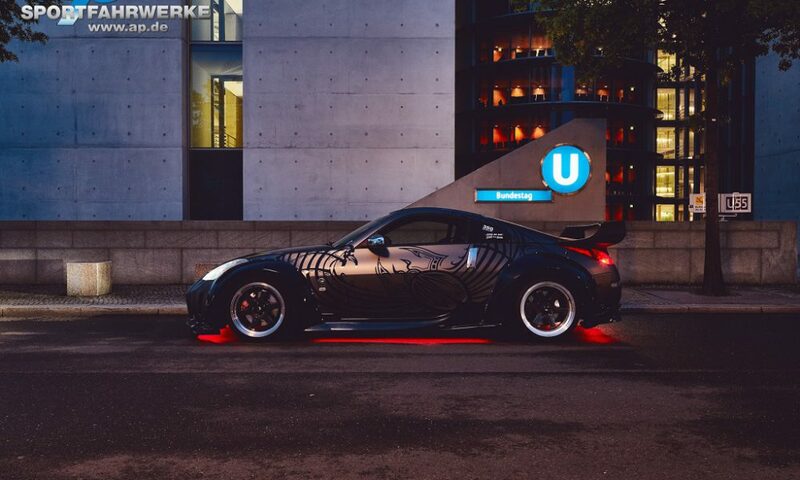 Why did you choose the 350Z? To be honest, I had a 350Z before but I almost killed myself in it and of course I killed the car. But I am one of these guys who will never quit, so I just started the project all over again. The car looks pretty flashy. How much money did you put into it? I think it`s about 15.000 Euro. Just the TÜV records are about 2.500 Euro. 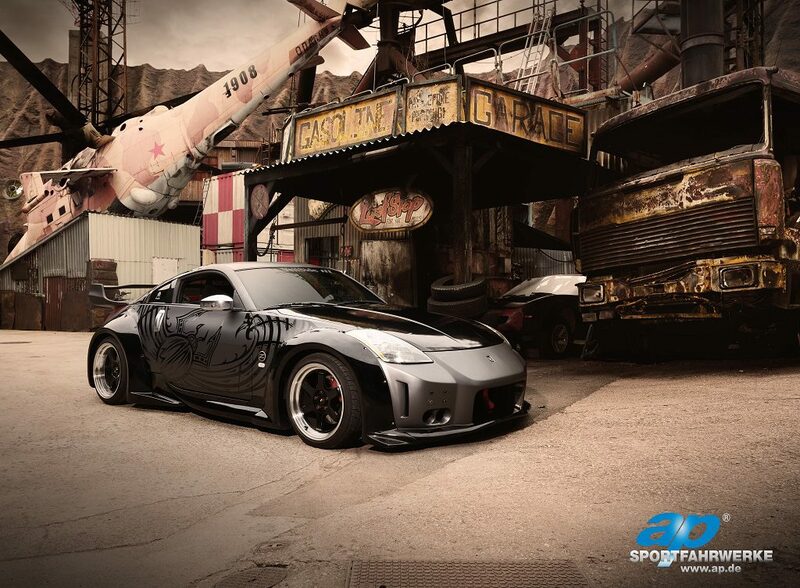 Please tell us what you have done to get that „Tokyo-drift“ look! The most striking thing may be the Veilside body-kit with the wide-body look. I have also a story to tell about that but lets stick with the changes first. I also added a ap-Sportfahrwerke coilover-kit as well as Japan Racing JR12 18 inch rims with Nexxon 255/35/18 / 245/35/18 tires, M-Tech brake discs, a pretty loud Japspeed K1 exhaust-system, facelift-back-lights and the „tokyo-drift“ car wrapping. In the opposite to the movie-car the car wrapping is on both sides because I liked that more. Sparco Rev seats with OMP seat brackets. A Nismo gear knob, a Sparco Lap 5 steering-wheel and some Alcantara on the dashboard. I also added a pretty tricky illumination in the ventilation system and got rid of the Bose sound-system. Now, the car features new Audiosystem components with 2 power-amps, a subwoofer and a double-Din-radio. Did you just say, you want to tell us a story? Yes, of course. I own the car since 2015 and at first I had this drift-racing look on the car. But than, I decided to try the „Tokyo-drift“ thing again. Back at that time, I signed a contract with the cinema at the „Technikmuseum in Sinsheim / Germany“. I agreed to be there at the premiere of the 8th Fast and Furious movie. So, I needed to be there and the car had to be ready. The body-kit should be in time, many month before the movie premiere. Well, weeks and months did pass by, no body-kit. Finally, 10 days before movie-premiere, the body-kit arrived. The work on the car started at April 3rd. Movie premiere was April 10th. Did I mention that the body-kit came without the rear wing? Anyway, I did install all the other body-kit components and brought the car to the painter. Bad idea. The paint-job was horrible and the car looked kind a concrete-grey. I was really pissed and I was running out of time. I brought the car to a friends house and together we did the car-wrapping within 2 days. Almost done. The rear-wing was still missing. Day of the movie premiere, 5 pm. The rear wing had finally arrived. No time for painting, I just assembled it and was in time at 8 pm at the movie premiere. Nice story! How is the rest of you car-live? I started with car-tuning because of friends and because of the Tokyo-drift movie. I try to fix as much as I can myself on the car, but I am not a professional mechanic. 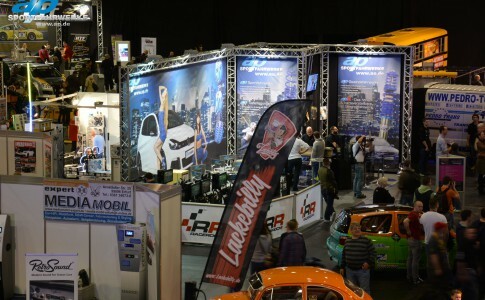 At the moment I am not member in a car club but I like to visit different car-events. I really dislike the many „every day“ tuning cars where nothing is changed except wheels, car-wrapping and lowered springs and I am also really not into air-ride. I do like good car-audio systems, JDM style cars and Liberty Walk stuff. Did you have any other dreams and wishes, regarding your car-life? Easy answer. 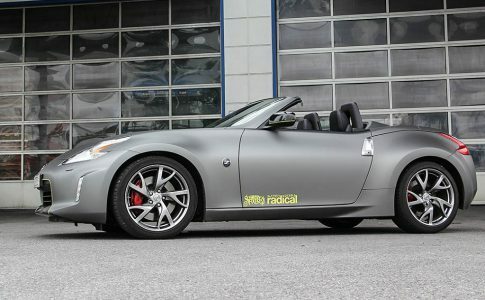 I would like to have a turbo rebuild for the 350 Z and I would love to own a GTR.